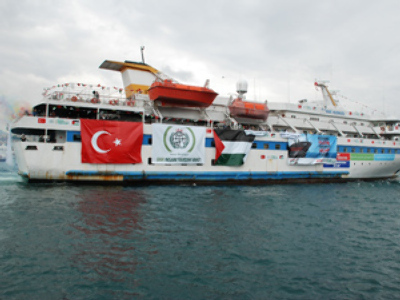 As the battle over the Gaza flotilla is raging in the world’s press, Israel is fighting back. The Israeli government is hoping YouTube and Twitter can help restore its reputation. The troops it has sent into cyberspace are relatively few – Aliza Landes, who heads Israel Defense Forces’ foreign press branch and four people under her command. When the flotilla disaster struck, they posted a footage filmed from an Israeli naval boat alongside the ship. It shows passengers beating up Israeli troops. The footage was filmed from a chopper above and shows the commandos on board. Nearly two million people watched the videos making them the two most popular hits on You Tube this week. But some critics won’t let Israel get off the hook so easily. “Israel is in the business of manipulating public opinion, it has been in this business for 40 or 50 years. They are very smart about how to create a media narrative, how to present themselves as the victims in almost every instance and how to portray anyone else as the aggressor or even perhaps anti-Semitic,” believes Danny Schechter, American blogger, film maker and media critic. Israel’s battleground has shifted from the Mediterranean to digital data. And they know it – which is why immediately after commandos stormed the flotilla, the Israeli army tried to block all forms of communication. But their plan failed. And the cameras on the boat successfully transmitted images throughout most of the takeover. “If you look at the Israeli media, the way they describe it is lynch or that the Israeli soldiers were ambushed. They are now mocked by the entire international community,” says Gilad Atzmon, jazz musician, writer, and former Israeli soldier. Since Tuesday, the IDF has uploaded 15 new videos. It includes footage from the incident, arrests, confiscations, and interviews with wounded soldiers. But many Israelis feel their government and army are not doing enough to put across the Israeli point of view and this is why hundreds have taken to the streets of Tel Aviv to try and get their voices heard. The word “Flotilla” has been tweeting around cyberspace for days now – and is likely to continue for a few more as three more ships head for Gaza.